The countdown clock is officially ticking. Not for Christmas, but happy holidays and merry Festivus to you all! No, I’m referring instead to the January 2nd one-hour season premiere of Community on NBC. The critically-acclaimed sitcom that relies on a healthy mix of rounded-out characterization and meta-commentary on both other entertainment tropes and on its own world begins its fifth season as we ring in 2014. NBC recently released teaser trailers for people clamoring for the return of Greendale Community College’s study group. 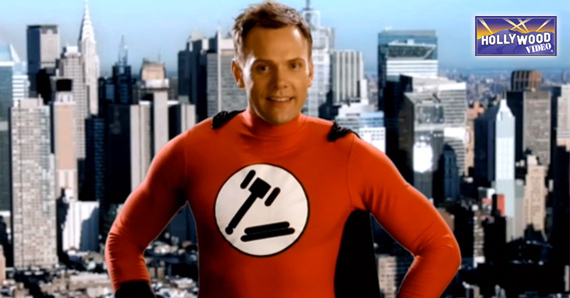 Jeff Winger (played by Joel McHale) returns to Greendale as a teacher. After leaving the school upon graduation, it appears his post-college career has been far from stellar. The campus appears to descend into a fugue state of chaos at some point in the semester, with Britta (played by Gillian Jacobs) becoming something of warlord (warlady?). Is Britta no longer “the worst”? Professor Ian Duncan (played by The Daily Show’s John Oliver) makes a blink-and-you-missed-it appearance in one of the trailers, marking his first appearance on the show since season two. Rob Corddry returns as Jeff’s nemesis from his previous life as a lawyer. On the eve of the fifth season of the cult favorite, fans are hoping that this outing will pave the way for #sixseasonsandamovie. Jed Harris-Keith is a pop culture junkie, but insists he can stop whenever he wants. He currently resides in Chattanooga, Tennessee, with his wife and their two bassets, Otto and Igor. This entry was posted in Trailers and tagged community, joel mchale, nbc, television previews, trailers by jedkeith. Bookmark the permalink.